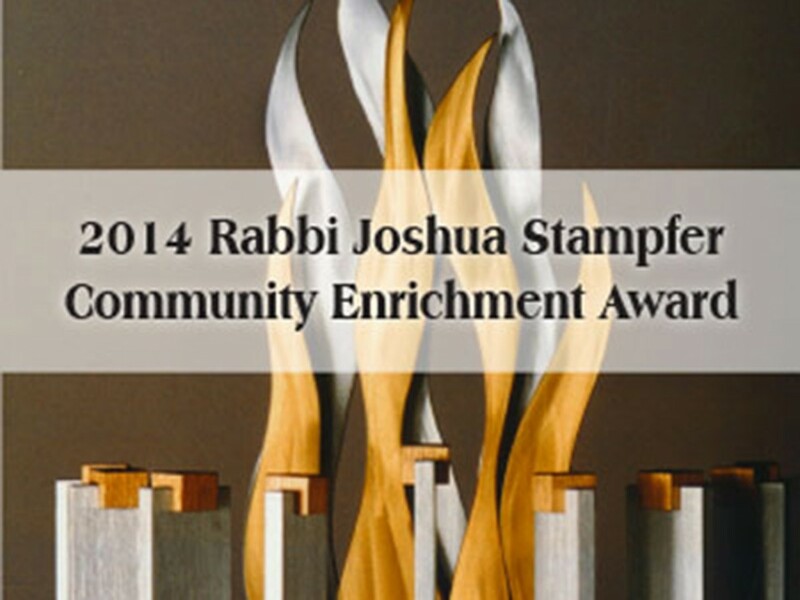 Jakob (Jake) Kryszek is the 15th recipient of the Rabbi Joshua Stampfer Community Enrichment Award. The nonagenarian receives this honor the evening of Thurs., Dec. 11, in Congregation Neveh Shalom’s Birnbach Hall at 2900 S.W. Peaceful Ln. The dinner costs $60 per person; all proceeds cover the event, which is not a fundraiser. The celebratory and moving evening attracts hundreds of Portlanders from within and without the Jewish community, and this year will include a number of Kryszek’s loved ones from out of state. Also featured are Congregation Shaarie Torah’s new Sr. Rabbi Joshua Rose, who will lead the invocation and ha’motzi, and Lisa Kaner, a lawyer and long-time friend of Kryszek’s, who is the evening’s emcee. The kosher dinner will be provided by Century Catering. Look for your invitation in early November’s mail. Kryszek may be well known in Portland as an entrepreneur; he purchased as a family business and continues – now in his 96th year of life – to run Columbia Knit Inc, which produces all manner of warm knitwear for men, women and children. He is perhaps best known, though, as a survivor of five concentration camps and one who has and continues to tirelessly educate others about Holocaust horrors and support efforts for its remembrance. For example, in memory of his first wife, Sala, also a survivor, Kryszek and his sons founded the Sala Kryszek Art and Writing Competition, which encourages both educators and young people to teach and learn about the Holocaust and fight injustice in their own lives and others’, regardless of race, creed, or sexual orientation. Kryszek explained that after Sala’s death, the couple’s friend, Sylvia Frankel, encouraged him and his family to put in place the writing competition the family had been contemplating creating. He said, “(My family and I) started a very small program that today has evolved into an opportunity for young writers and artists; they create something about the Holocaust and go to Wash. D.C., with their teachers to visit the United States Holocaust Memorial Museum. “This has had far-reaching effects as they share their experiences with all those they know,” he added. Kryszek also was part of a seven-member delegation of local survivors who returned to the sites of their torture in Poland. There, they collected soil and ash that they brought back to Portland, to place beneath the large rock at the Oregon Holocaust Memorial in Washington Park. “This trip was made at great emotional expense to each of the survivors,” Kaner, the award event’s emcee, said. “I have a deep commitment to the teaching of the Holocaust. It is my lifework. In the Lodz (Poland) ghetto, where all Jews had to live, in 1939, I heard if I volunteered to work, my family would get more food rations. I signed up and was immediately sent to Germany to help build the Autobahn. I never saw my family again. A Nazi foreman -- big, tough, strong, mean – oversaw our work, that it was done properly and on time. After a time, once he returned from his meals, he sometimes brought back some leftovers, perhaps a half sandwich, and hid it. With a gesture to me, I understood it was for me. Perhaps he did the same for others. I had no way of knowing, and I would never know. One would not dare mention such a thing because of terrible consequences. In those terrible times, here was a man with compassion, feeling and courage. There were others like him. In Israel, at Yad Vashem, there is the Garden of the Righteous to recognize gentiles who at personal risk and for no financial or religious reasons, chose to save the Jewish people. There were people like this, even among the Nazis. There are always opportunities to do good things. There are times that are the right times. Sometimes you don’t know until someone points it out to you. The Jews have a long history of being attacked and made to be victims. We say ‘never again’ about the Holocaust, but that is not enough. Dr. Merritt Linn in 1999 founded the Stampfer Community Enrichment Award; soon thereafter he was joined by a few members of the Portland Jewish community who created a non-fundraising event to honor pillars of the community, either Jewish or non-Jewish. This pillar must fill big shoes: The founding committee named the tribute after Rabbi Emeritus Joshua Stampfer, whose values, love of the Jewish community, ideals of tzedakah and tikkun olam, life-long learning, and more always would be an example to others. Indeed, as was fitting, Stampfer was the award’s first recipient. The following people have been the honorees since 1999. Hershal Tanzer (z”l) (2001), Jerry and Helen Stern (2002), Milt Carl (2003), Henry Blauer (z”l) (2004), Dr. Victor and Toinette Menashe (2005), Shirley Tanzer (z”l), in memoriam (2005), Alan and Eve Rosenfeld (2006), Irwin and Renee Holzman (2007), Madeline Nelson and family (2008), the Zidell family (2009), Ruben and Elizabeth Menashe (2010), Priscilla Kostiner (2011), Arden and Lois Shenker (2012), and Jim Winkler (2013). Linn, one of the award’s founders, received the award as a surprise in 2011. The award event this year also features outstanding youth recognized for their impressive scholarship, philanthropy and love of the Jewish community. Prof. Sylvia Frankel, one of the Community Enrichment Award’s founders, in 2006 created the youth award. On Dec. 11, a select group of high school students who have enriched the community will be fêted. Their names will be announced later in the fall. Since the award’s inception, outside venues played host to the culminating dinner event. This year, the award’s founders have stepped back, paving the way for Rabbi Stampfer’s synagogue of more than 40 years, Congregation Neveh Shalom, to house the evening in perpetuity. For more information and to purchase advance tickets online, please click here. You may contact 2014 event chair Jenn Director Knudsen with any questions; she can be reached at jdknudsen@yahoo.com, and (503) 807-5816.